To be honest, the last few weeks of January have been a bit of a struggle for me. This morning I rose in darkness to the sound of rain clattering against the bedroom window and I just wanted to crawl straight back into bed. I feel like I’m living in Narnia’s perpetual winter. At the beginning of the month, even before the Christmas decorations were down, my hubby, Charlie left for a three week-long work trip to the Antarctic. It’s always wintery in Antarctica. Even in Summer when the sun shines at midnight, temperatures rarely get above freezing. Stories of the Antarctic’s unforgiving climate have made me feel grateful for our own seasonal weather. After all, these dreary dark days help us to appreciate the light all the more when it finally arrives. Yesterday, as I was heaving a delivery of logs into the house, the sun appeared briefly from behind the clouds, throwing great shafts of light onto the fresh green shoots of narcissus and grape hyacinths now clearly visible through the woody undergrowth of the flower beds. My spirits lifted and for a moment my thoughts were on Spring’s imminent arrivaI. For now, I’ve decided that I shall embrace the last of the cold hibernation months. What’s more, it’s a good excuse for long, lazy lie-ins at the weekend (or slipping back under the bedcovers with a cup of strong tea after the school run, or is that just me!). Charlie arrived home last week and on Saturday morning the kids piled into our bed. While we lay propped up on pillows, sipping strong coffee, the kids sat at the end of the bed balancing bowls of Rice Krispies on their laps. I’ve never been very big on breakfast, but I do have quite a sweet tooth, so if anything it’ll be something sweet I’m craving first thing. Unfortunately, almond croissants are off the menu for me these days, and I’ve taken to making my own granola, which satisfies my sugar craving but is still relatively healthy. And the added bonus is that it keeps me going until lunchtime, so I’m not dreaming of doughnuts by ten thirty. I pour semi skimmed milk over it during the week, but this weekend as a special homecoming treat, I sprinkled handfuls of it over greek yoghurt and served it with rosemary infused honey and chargrilled pineapple. I cut out the mango stars using a tiny cookie cutter. They're not very cheffy, it's true but they brought a smile to Charlie’s face and that’s enough for me. 2. Use a sharp knife to cut the skin off the pineapple before chopping it into wedges. Char the pineapple wedges on a searing hot griddle pan, pushing down on them with a spatula (or a pan lid) until the juices are released and the natural sugars start to caramelise, but being careful not to let them burn. Set to one side once the wedges have softened. 3. Heat the honey gently in a pan with two to three tablespoons of water, then add the rosemary. Once the honey has melted, leave the pan to one side for at least twenty minutes with the lid on to let the rosemary flavour infuse and the mixture to cool. 4. Mix the dry ingredients for the granola in a large bowl. Add the vanilla extract, maple syrup and coconut oil and use your hands to rub the dry ingredients together with the syrup and oil, making a sticky, crumble-like consistency. The warmth of your hands will melt the coconut oil, but any small pieces that are missed will soon melt in the oven. 5. Spread an even layer on a baking tray, then bake in the oven for eight minutes, turning the mixture with a spatula half way through cooking. You may find you have to put it back in for a few minutes it’s it’s not quite done. I like mine with a really nutty, toasted flavour, so I keep putting it back in the oven for a couple of minutes at a time until it’s done to my liking, but you do have to keep a watchful eye on it so it doesn’t burn. 6. 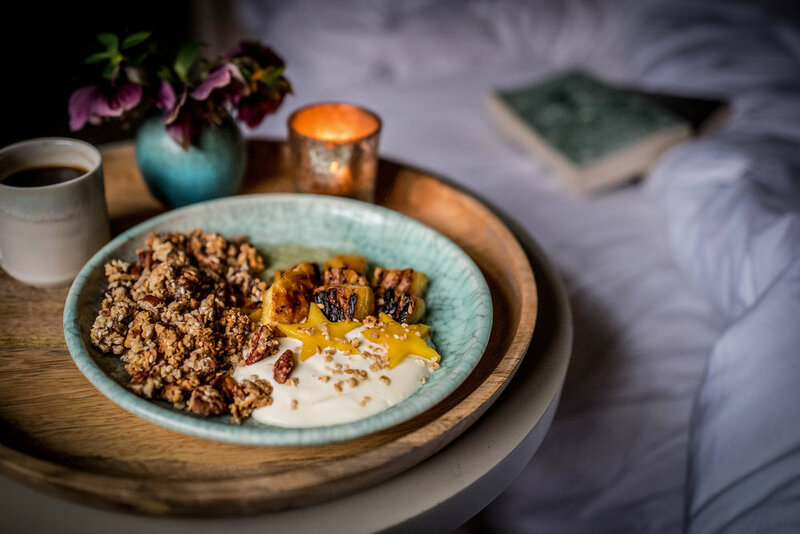 Arrange a few dollops of yoghurt on a plate with the charred pineapple and a sprinkling of granola. Sieve the the honey then drizzle it on or around the yoghurt and pineapple. Tip: For a more indulgent granola, try swapping the pecans for macadamia nuts and adding dark chocolate chips once baked.